Life As I Know It: "Strawberry fields forever"
I don't have much to say today...well, I do I just don't really want to start on anything deep and I have no ideas for anything political or goofy. So here's a picture that I took this week outside work. Someone dropped this strawberry in a really high traffic area of the parking lot, and it was there, not run over or trampled on, several hours later. I think it turned out to be a pretty good picture. 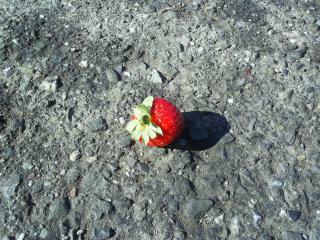 That strawberry is a survivor. How cute! It's a wonderful picture! I love the cheery splash of red against the dull pavement. You're a proper artist you are, Spin. I think I might've picked it up and eaten it. Great pic. I have to wonder if people tried to avoid it or if it was just dumb luck. The world may never know.